This Thursday, March 28, is the date for Shropshire auction house Mullock’s to stage this sale, taking place at the principality's stadium in Cardiff. 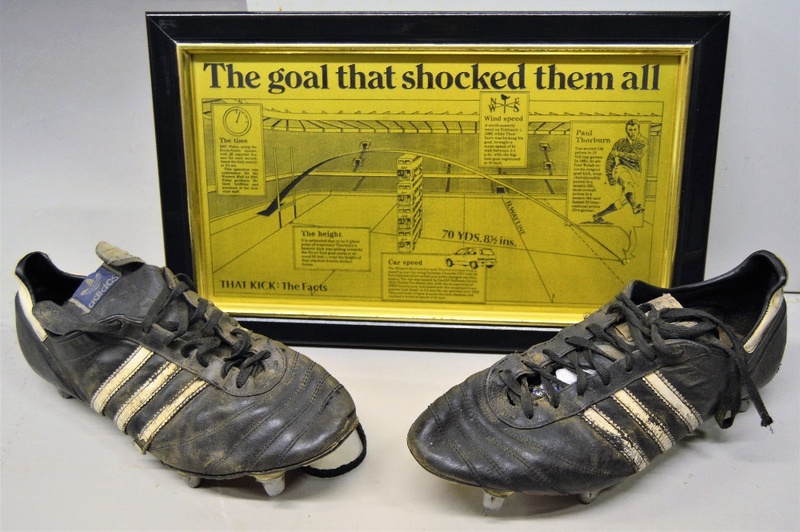 Appropriately given the timing, a stand-out lot is a pair of Adidas rugby boots worn by a previous Welsh rugby great - Paul Thorburn - when he completed a record long distance penalty kick during a match in 1986 between Wales and Scotland. He booted the ball from 70 yards 8½in against Scotland during the Five Nations game at Cardiff Arms Park. It remains the longest successful kick in an international test match. Thorburn has consigned the boots and a copy of Western Mail’s printing block graphic illustrating the successful strike, to Mullock’s 600-lot sale of rugby memorabilia held at Wales’ Principality Stadium in Cardiff on March 28. Proceeds from the lot will go towards The Doddie Weir’5 Discretionary Trust. Estimate £500-750. Another rugby-obsessed country is of course New Zealand, winners of the previous two world cups (2011 and 2015) and hoping to complete a hat-trick in this year’s tournament taking place in Japan in September and October this year. Mullock’s is offering the late Sir Colin Meads' last overseas test jersey, 1970. Consigned by a fellow All Black with whom it was exchanged, and coming with that provenance and a Certificate of Authenticity signed by Meads, this is his No 5 jersey from the last test against the Springboks in South Africa at Ellis Park, Johannesburg, 1970. The jersey is estimated at £6000-8000. Meads (1936-2017) – nicknamed pine tree because of his physical presence - captained the All Blacks 55 times and retired after the Lions tour of 1971. 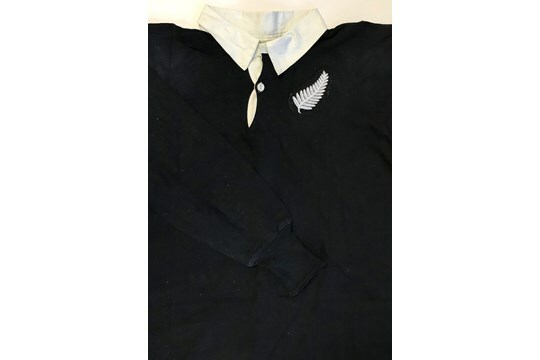 Fellow auction house Rogers Jones, based in Wales, has sold two 1905 era All Blacks jerseys recently for sizeable sums. On March 1 in Cardiff it offered Hubert Sydney Turtill’s shirt for his only All Black appearance, against Australia, before becoming a rugby league ‘All Gold’. It sold for £39,000, returning to New Zealand after being purchased by a consortium. 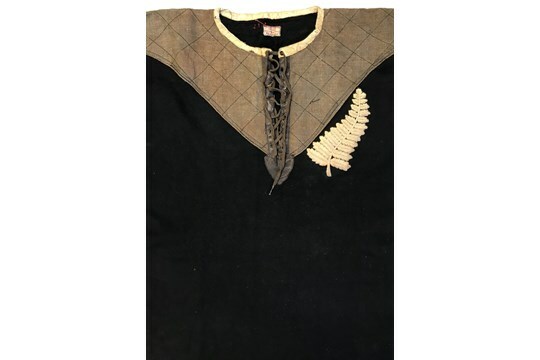 That sale followed Rogers Jones’ 2015 auction of the New Zealand rugby shirt worn by captain Dave Gallaher on their 1905-06 British tour which made an auction record hammer price of £180,000. In this latest auction Mullock’s offers another 1905 New Zealand All Blacks 'Originals' Tour to the UK estimated at £20,000-25,000. Although not linked to a specific player, Mullock’s notes: “This lot was consigned with impeccable provenance from the descendants of the famous Ireland international rugby player Basil Maclear, with whom an All Black exchanged jerseys after one of the, amazingly, four games in which Maclear turned out against the almost-invincible NZ tourists: Blackheath, Bedford, Ireland and Munster, whom he captained. This 1908 programme for the rugby 'game that never was', Australia v Monmouth in 1908, is estimated at £150-200 in Mullock's auction on March 28. If your budget is more in the hundreds than thousands, don’t despair – the auction includes desirable items for rugby fans and collectors at a wide range of estimates. 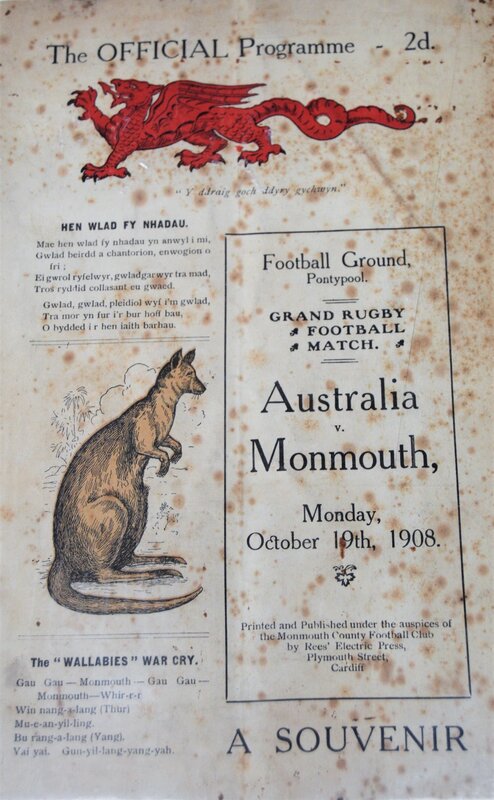 For example, the 1908 Australian Wallabies v Monmouthshire Rugby Programme. This is for the 'Game that never was'. It was to be played at Pontypool but this several-times postponed game from the First Wallabies' Tour to the UK was never actually played, the weather always intervening - adding to the rarity and collectability of the issue. The estimate is £150-200.